The key to successful prayer is our relationship with God, which is a vertical one that goes through each member of the Triune God. We pray through Jesus, by way of the Holy Spirit to God the Father. The reverse is true when receiving God's blessing. The blessing comes from God the Father, by way of the Holy Spirit, through God the Son, to us. 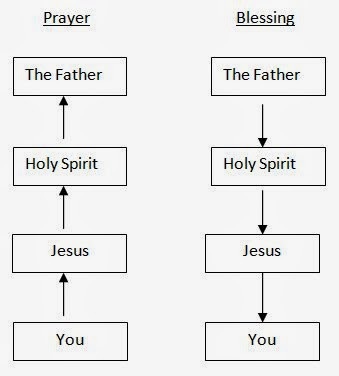 We must acknowledge both Jesus Christ and the Holy Spirit in our prayer life. While Christ is Lord over the church, the Holy Spirit is Lord in the church. While all true Christian churches acknowledge Christ as Lord over the church, not all acknowledge the Holy Spirit as Lord in the church. Without the Holy Spirit in the picture, we can have all the right doctrine and say all the right words, but our prayers never leave the building. And yet, we wonder why God doesn't answer our prayers.